The Medical Review Officer's Guide to Drug Testing makes it easy to understand current federal guidelines and select the best approaches for your needs. Tables, checklists, and record-keeping forms help you standardize your drug testing operations. This reference also reviews federal drug testing regulations, describes drug testing procedures and addresses risk management strategies. 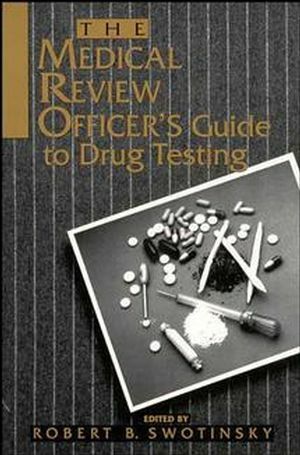 Robert B. Swotinsky is the author of The Medical Review Officer's Guide to Drug Testing, published by Wiley. Drug Abuse in the Workplace (J. Autry & J. Friedman). Drug Testing in the Workplace (R. Willette & L.Kadehajian). Drug Testing Collection Procedures (R. Swotinsky & J.Beatey). Forensic Laboratory Drug Testing (A. Jones & M. Peat). The Medical Review Officer Function (R. Swotinsky). Risk Management (W. Judge & R. Swotinsky). Employee Assistance Programs (L. Stockman). Monitoring Laboratory Performance (D. Crouch & Y.Caplan).